Rec. April 3 & 4 2014, Sciensonic Laboratories, Teaneck (NJ). A glorious celebration of the late Sam Rivers. On the digipack in which the CD comes, Joseph Daley writes “This project is dedicated to the memory of my good friend and mentor Sam Rivers, remembering the inspiring times that I experienced at Studio Rivbea in New York, under the watchful and supportive eyes of both Sam and Bea Rivers”. For all the use of words such as “memory” and “remembering”, the music is not essentially retrospective or elegiac – rather it celebrates Rivers’ commitment to musical innovation and adventure by itself being innovative and adventurous. Only one tune here is actually by Rivers, ‘Beatrice’, a tribute to his wife – an apt choice given Daley’s dedication of this album to “both Sam and Bea Rivers”. Of this tuba trio both Daley and Smith worked with Rivers in his tuba trio. Robinson is a remarkable musician, less well-known than he ought to be, who, like Rivers himself, has included many kinds of jazz in his career. His CV includes, in no particular order, work /recordings with John Pizzarelli, Randy Sandke, Ruby Braff, Clark Terry, Frank Wess, Paquito D’Rivera, Bob Brookmeyer, Anthony Braxton, Don Sebesky, Maria Schneider, Marshall Allen, Henry Grimes, Ron Carter, Carol Sloane, Manhattan Transfer, Bob Mintzer, Max Roach, Ronnie Cuber, Lionel Hampton, Illinois Jacquet, Ravi Coltrane, Jack McDuff, Freddie Hubbard, Doc Cheatham and Joe Lovano. (Oh, and David Bowie and Jessye Norman!). Each member of this trio is a multi-instrumentalist (see above), which means that the sound texture is constantly shifting, though always staying in the bass range. The longest track is ‘Terrarium’ (20:38); the others range from the shortest, Emergence’ (5:30), to ‘Interplay’ (12:31). ‘Terrarium’ is also the most complex and rewarding track on the album. In the brief notes with this CD it is described thus: “Prepared sound textures as a color palette for development by each member of the ensemble”. The “sound textures” were prepared by Daley. Over them Daley plays, at various times, the euphonium and the tuba, Robinson is heard on bass flute and contra-bass clarinet, as well as waterphone, theramin and ‘Photo theramin’ (which, I believe, uses a light sensitive photocell to control pitch. Smith’s array of percussion includes tympani, wood blocks, MPI and marimba. The prepared electronic track serves, to pick up Daley’s reference to “a palette”, as a kind of canvas on which the three ‘live’ musicians ‘paint’ a number of shapes and patterns, singly or together. As on most of the other tracks, ‘Terrarium’ contains a good deal of group improvisation. Smith’s marimba is subtly beautiful; Robinson’s bass flute and clarinet are often prominent and often exist in improvised counterpoint with Daley’s brass instruments. A terrarium can refer either to a vivarium for small land animals, most often reptiles, or to a sealable glass container in which plants are grown. The second meaning seems most relevant here. There is certainly nothing ‘reptilian’ about the music; indeed, I wonder if there may not be an interesting allusion in the title. During the 1970s the Rivers, husband and wife, organized one of the most important of the ‘jazz lofts’ of the period, known as ‘Studio Rivbea. It was a major centre for the freer jazz of the time and many important musicians (including Daley) played there. A major series of recordings made there was issued by Douglas as a series of LPs, under the collective title Wildflowers. The allusion is surely there on a ‘tribute’ to Sam and Bea Rivers. ‘Terrarium’ is not, I suppose, ‘easy listening’, but it is certainly rewarding listening and its collective improvisation is never wild or ugly. Indeed, I’d say that it has, predominantly, a meditative, even spiritual, quality – though Smith’s busy percussion ensures that it never becomes static or stays in the same mood for too long. A fascinating piece – my only complaint is that both my CD players had tracking problems when playing this track on the review copy I had. If my talk of free jazz and collective improvisation scares anyone, they might like to try the beautiful reading of ‘Beatrice’. This is a relatively ‘straight’ rendition of what is one of Sam Rivers’ most frequently played compositions. Smith is impressive at the vibraphone at the beginning of the track, producing some wonderful floating textures; there is some beautiful interplay between Daley’s tuba and, at different points, Robinson’s tenor sax and bass flute. The track should surely convince any listener just what good musicians all three members of this Tuba Trio are. I have said enough, I hope, to make it clear that I find this an exceptionally interesting and satisfying album. The fascinating interactions between the musicians are a delight in themselves and track after track produces rich and unfamiliar textures. 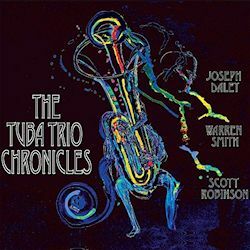 Do please try The Tuba Trio Chronicles if you can.